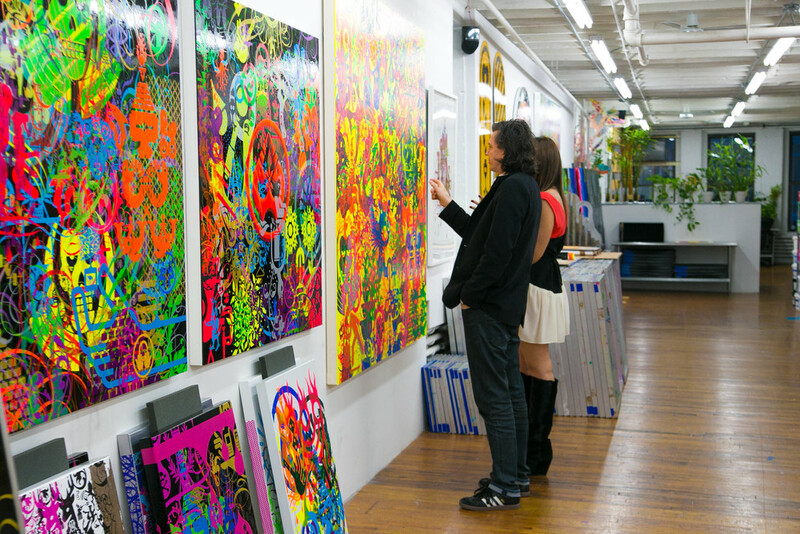 Visiting Ryan McGinness in his studio is almost like getting a crash course in different media and art techniques while revisiting certain periods of art history in the process. 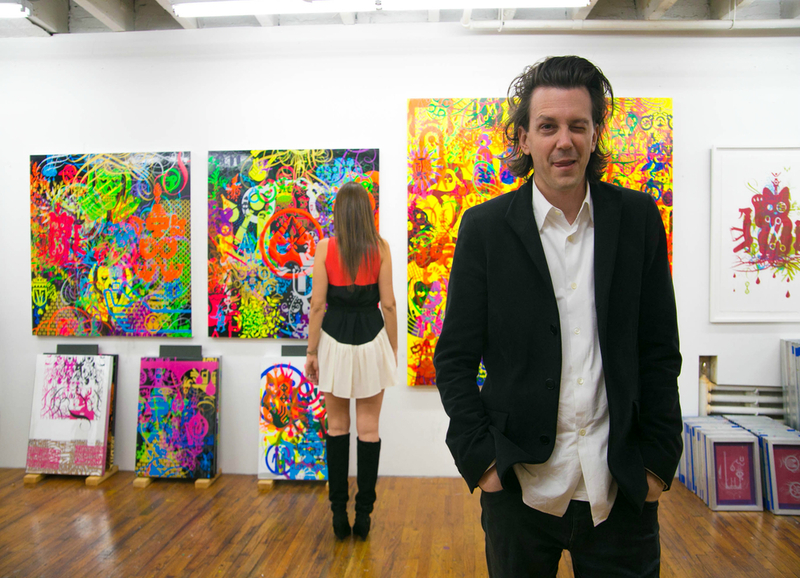 A consummate perfectionist who when asked what inspired him to be an artist answered that "he didn't have a choice", McGinness has developed throughout the years his own distinctive visual vocabulary. What starts with his own original sketches of graphic designs whose shapes come from places as different as public signage and the female body usually evolve to become masterful compositions containing hundreds of layered silkscreen silhouettes that interact with each other, in an intuitive and bold way. Ryan is prolific and has worked with so many different media; I can't really keep up with everything he has done. From hand-embroidered fabrics made in France used to create special pieces with Ryan's distinctive shapes to sculptures made of acrylic and printed directly on substrate to innovative print-making, McGinness keeps himself on his toes and constantly evolving his practice. I can't help to notice that Ryan has designed and published more than 10 books since the beginning of his career. Some are compilations of his work, some are exhibition catalogues, and some are essay collections that he has put together in an interesting way. I ask him how he can produce so many books and he calmly answers that he has always organized his materials and that for him is easy to keep track of everything he has done if he can see it all laid out in the pages of a book. 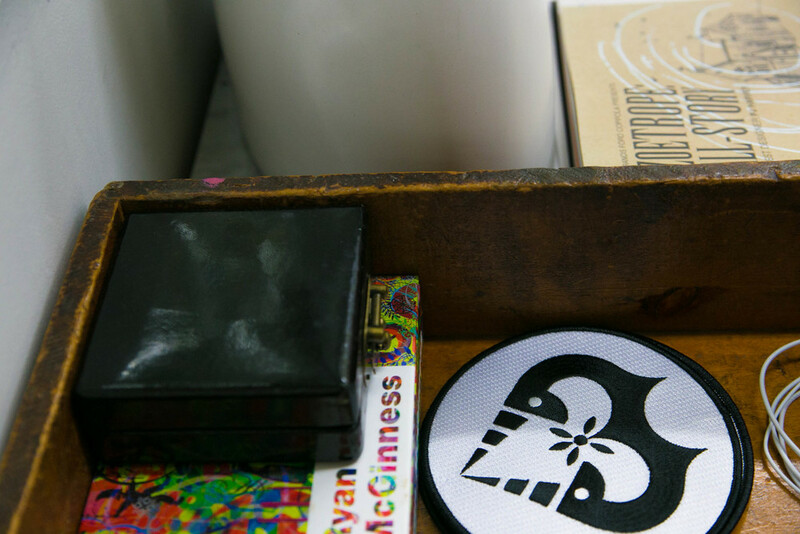 Also, as an excellent example of the artist-entrepreneur, McGinness has just launched his own e-commerce shop with selections of all the product collaborations that he has done with a wide variety of companies ranging from high-end shirts with Agnes b., to skateboards printed by Alien Workshop. On November 8, a new exhibit will open at Quint Gallery in La Jolla, California. Ten new paintings and ten monoprints will be hanging on the walls of what would be Ryan's fourth solo show with the gallery. I had an opportunity to see some of the paintings, which are, terrific views into McGinness’s studio. Metadata in the best sense of the word: paintings inside of paintings outfitted inside silver or gold-leafed frames that Ryan has designed. I could have stayed for hours and hours seeing more and learning more about the genius of McGinness but as our time together drew to a close, I could only feel grateful and elated for getting to know Ryan and for stepping into his extraordinary world.